In a bitter victory for Hong Kong's fragile civil society, 11 of the 14 WTO protesters were finally set free Wednesday Jan. 11, after waiting over three weeks for justice to be delivered. However, this delay left bruises not only for the victims of a misuse of police authority, but for fellow Hong Kongers who dream of seeing their city rise to the level of a world class center of human rights and democracy. The 11 defendants -- eight from South Korea, three from Japan, Taiwan and Mainland China -- were released after the court ruled the police did not have enough evidence to prosecute. Charges will proceed against the last three remaining South Koreans who face up to five years in prison if convicted. They will be allowed to return home until their trial begins at the beginning of March. This decision comes after the police requested a delay in the original trial scheduled for Dec. 30. Allegations by civil rights activists -- previously reported by OhmyNews International -- that the police had a weak case, appear to have borne fruit. 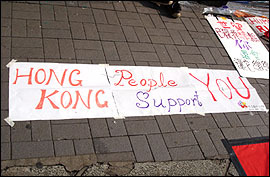 This is a blow for promoters of civil society in Hong Kong. The police should be the bastion of accountability and due process, not the incompetent or reckless enforcers of law. Hong Kong can only hope that lessons have been learned and the police will now allow an independent investigation to proceed into their handling of security for the WTO conference. Among the allegations the police face is their ill preparedness, excessive use of pepper spray, the firing of potentially lethal "beanbag rounds" on the large crowd, and failure to provide adequate translators subjecting many of the detainees to unnecessary police force and distress. The three defendants to face trial -- Park In Hwan, Yun Il Kwon, and Yang Kyung Kyu -- said in a statement (PDF) that they "in no way started a riot nor was it their intention to do so." They claim to have been provoked into taking desperate actions because they were denied access to a WTO process that would adversely influence their livelihoods. "Government officials and trade analysts had cloistered themselves in the convention center pushing forward to achieve some sort of consensus and finalize an agreement that would once again clearly favor developed countries, fail to alleviate poverty, and further increase the gap between the rich and poor,” the statement reads. Nobel Prize winner and former Senior Vice-President of the World Bank, Joseph Stiglitz agrees. Speaking in Hong Kong on the opening day of the World Trade Conference last month, he acknowledged that the WTO "sets up policies and makes decisions affecting almost every one in the economic world," but that "people who are affected by the decisions everyday have no right to vote." This "democratic deficiency" is a major cause for the volatile protests that accompany the WTO wherever it travels, according to Stiglitz. As is so often the case, wherever the WTO touches down it manages to successfully divide communities. Hong Kong is no exception. The community is still digesting the events that occurred outside on the streets during the conference, not those that took place behind closed doors. Unfortunately, along with the three South Koreans, the Hong Kong police also face charges, but of an altogether different kind. Theirs, however, is arguably the more severe -- the failure to uphold the basic human rights afforded to all in a civil society.